Fru-Gal.org: Free Scotch Tape @ Target! Free Scotch Tape @ Target! 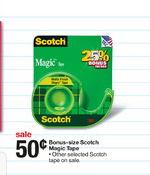 Scotch Magic Tape is on sale at Target for $.50 this week! Combine the $1/1 Scotch Magic Tape manufacturer Q with the $.50/1 Scotch Magic Tape Target Q to get these free, plus overage! These would make great additions to an OCC shoebox.